This paper reviews two bodies of research. The first pertains to identification of threats to children's optimal development and the second examines the effectiveness of different types of targeted programs intended to enhance the development of at-risk children. Many variables that put children at risk for developmental problems occur in both lone- and two-parent families and across all income levels. The current practice of restricting programs for at-risk children to specific neighbourhoods inevitably means the exclusion of many at-risk children. The second body of research demonstrates that at-risk children's development is enhanced through high- quality, centre-based group programs but not through programs that focus solely or primarily on trying to change parental behaviour and/or providing family support. Evidence from a third body of research demonstrates that non-targeted, ordinary high-quality community child care centres are effective in promoting the development of both at-risk children and children not deemed to be at risk. 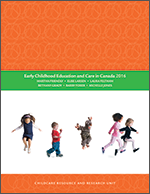 The paper concludes that targeted early childhood education programs are not in society's best interest. A high-quality, publicly-funded universal child care program is not only desirable, it is affordable and sustainable. NOTE: Each chapter is available in pdf from the linked list below.